The bags exceeded expectations! I couldn't be any happier with my order with Custom Earth Promos. Very unique bags and super durable. Highly recommend this company. Everyone at my last convention loved the uniqueness and color variety of these bags. These cost effective bags are one of a kind and very affordable. Custom Earth Promos satisfies me again! These bags were a perfect fit for me. The quantity of bags I received satisfied all my colleagues and I hope to purchase more of these bags in the future! Thanks again. The variety of colors to choose from is awesome. These eco-friendly bags are extremely reasonably priced and everyone at my last assembly loved them. Have NEVER had any complaints using Custom Earth Promos. Wonderful product. The logo looks amazing & our clients love the small size! The bags turned out perfectly and according to my exact specifications. Will definitely reorder from Custom Earth! The Custom Earth team did a great job in delivering these bags in a short time and exactly according to my specifications. I will certainly order from them again. My customers loved the personality of this bag, from the unique shape of it to the vivid colors offered. It's also so adaptable which only increases the value of the bag. I really like the non-woven polypropylene material these bags are made out of. Custom Earth Promos was a great company to do business with. This bag is the perfect size! A small, convenient way to promote our business. You can really see the remarkable amount of attention to detail CPE puts into their products. We are thrilled with how our bags turned out. Thank you! Love this bag! The shape is so interesting and unlike any other product out there. The unique shape of this bag is ideal for promotional purposes because it's so eye catching! So grateful for CPE and their amazing design team. I order bags all time, but I wanted something with a different twist. I spoke to Cory and he recommended these eco-friendly reusable totes. He sent me a sample immediately, and I was thrilled with the look. I placed my order for 5,000 and the rest is history. A unique style bag with great imprint space. I ordered 2,500 to start, and shortly after receiving my order I needed to place another order due to the popularity of the bags. Thanks again. The PP14 is structurally sound and cost effective for a company working on a small budget. We all love the modern look of these bags! Really impressed with the design and overall appearance. A great bag. We were able to promote ourselves in a new creative way through these eco-friendly tote bags. These bags have a unique look that sets us apart from other companies looking for exposure within our venues. Wanted an eco-friendly tote for the upcoming trade show, but I really wanted my bags to stand out. Everyone has the same bags. I customized these bags with their unique cut and I really couldn't be happier. Everyone notices the difference. This bag is truly unlike any other. I love the chic look and my customers do as well! I really like the unique design to these tote bags. They really stand out among other bags at all the venues I attend. 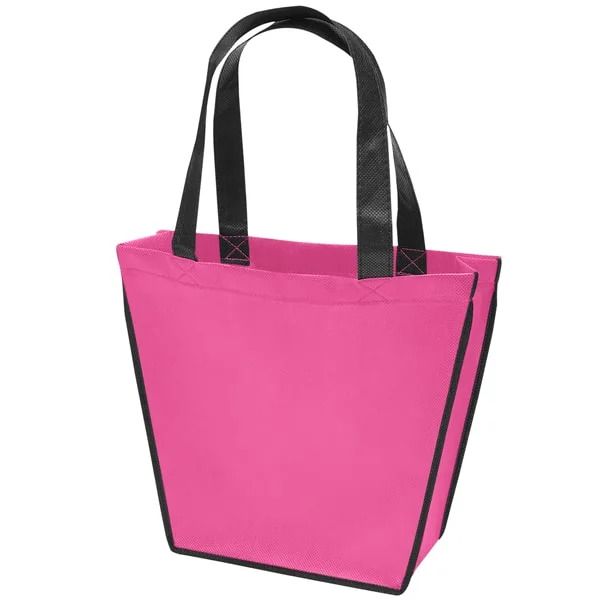 Customize this small, chic reusable tote bag with your logo and it will promote your business as well as environmental awareness! The modern look and bright color options of these eco-friendly bags are sure to stand out in a crowd! Stylish and fun to carry, our reusable tote bag's unique trapezoid shape and contrasting accent trim and handle make this an excellent promotional tote bag for your next event. This reusable tote bag is an ideal, compact size for stowing in your purse or briefcase for those spur of the moment trips to the convenience store. This trendy style of bag is a popular choice with boutiques, weddings, salons and more. Custom Earth Promos' eco-friendly reusable bags are made from a high-quality, fine-textured non-woven polypropylene; we guarantee you will be satisfied when comparing our products to other shopping bags on the market. The attention to detail in this bag is remarkable; contrasting black trim and handles in combination with the vivid color choices ensure your customers will want to use these bags over and over again! The included plastic bottom insert easily wipes clean with a sponge, and keeps your bags upright when loading or on display. 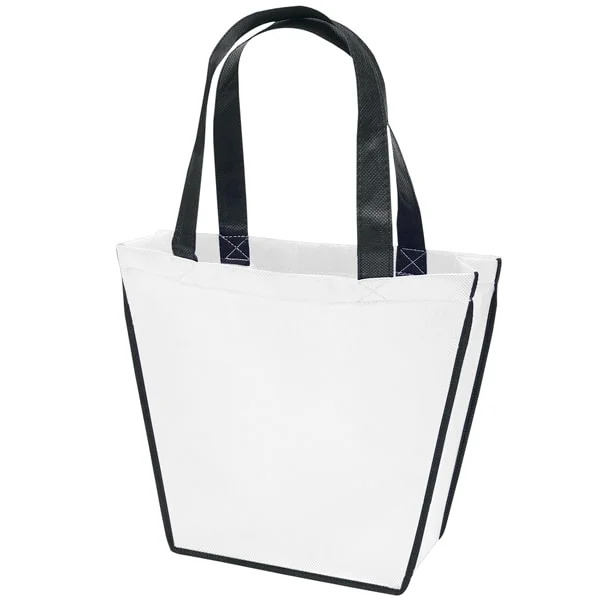 Our tote bags are the perfect promotional giveaway for your business. For a lower price and tons of options, consider ordering your custom reusable bags overseas! Our direct factory can turn your tote bag into a masterpiece by allowing you to choose the exact size, fabric/trim color, thickness, and custom accessories to fit your needs. Consider adding a business card holder on the outside, a carabiner clip, or maybe you would prefer nylon handles instead; the sky's the limit when you work with us! The in-house graphic design team at Custom Earth Promos is spectacular at working with your logo, or even creating one from scratch. We will even send you a pre-production sample so that you can see your exact bag before mass production. We work nonstop to ensure you are satisfied with your custom reusable bags!